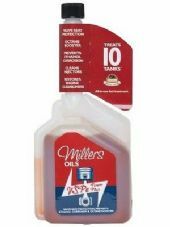 Millers Oils Classic Sport CVLe is a fuel additive. It prevents valve seat recession, ethanol corrosion and enhances combustion. Suitable for historic racing. Provides valve seat protection, prevents valve seat recession, prevents pre-detonation, hotsports and running on. Controls combustion characteristics to maximise performance. Unleaded fuels now contain ethanol which can cause fuel system corrosion problems in vintage and classic vehicles.